After their 1611 performance, actors from the Scottish play meet at a local tavern, with hilarious results. Banquo has a hearing issue, Macduff has taken his role a bit too seriously, the choreographer cannot stop choreographing everyone's actions, and the witches - well, are they actors or real witches? When their host unexpectedly drops dead, the play becomes a murder mystery with a surprising ending. The play is rich with historical and Shakespearean references, but you don't need to be an expert to appreciate the humour. 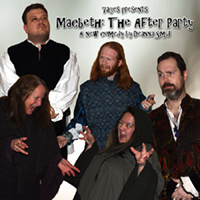 An evening of murder and mystery abounds as the original company of Macbeth enjoy their cast party. A little too into their roles, the actors band together to try and figure out a whodunnit. The cast did a very good job of playing their roles. They were funny and totally focused throughout the show. They had great costumes and used the space wisely. For a more amateur production I was very impressed by their fight choreography. Out of all the shows this year I’ve seen, this cast put on a really convincing sword fight that had me nervous sitting in the front row. I liked lots of jokes and the script idea was unique. I did like the jokes but most seemed to not land with the audience. I will say if your not familiar with Shakespeare or with some of the other playwrights of the time your probably not going to get a lot of the jokes. I also found some of the jokes were over used. The acting was decent but they tried way too hard to be funny at points and some jokes fell flat. An okay play with some decent acting. Worth checking out as a filler show or if you really like Shakespeare.